The seal was last changed in 1996. 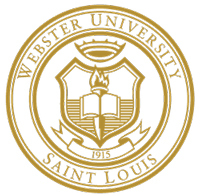 As part of the celebration for Webster University’s 100th Annual Commencement, the 100th Commencement Committee announces a contest to redesign the Webster University Seal. The contest is open to submissions from the global Webster University community of students, alumni, faculty and staff at every campus. During Webster’s Centennial in 2015, then-student Christopher Poetz ’16 won a contest to compose a new alma mater, and alumnus Michael Hillstrom ’94 won a contest to compose a Fight Song for Webster University Athletics. For the seal contest, a $2,500 prize will be offered to the contest winner. It will be unveiled before the 100th Commencement on May 11, 2019, and applied to materials beginning with the 101st Commencement in 2020. Webster’s seal, which appears in foil on diplomas and formal proclamations, has undergone periodic revisions since the original seal was changed in 1924. The last change was implemented in 1996. “The 100th Commencement is a great occasion to engage the global Webster community and reconsider how this symbol reflects our institution’s history, values and future,” said President Elizabeth (Beth) J. Stroble. “As we prepare to celebrate our 100th graduating class and 200,000th graduate in May, we look forward to submissions from our community that convey the lasting, global impact of a Webster University education,” said Provost, Senior Vice President and Chief Operating Officer Julian Schuster. See the contest submission page for contest rules and guideline, and to enter a submission. Submissions will be accepted until 5 p.m. Central on Monday, March 18, 2019.